I had the pleasure of meeting this precious soul as we were his last stop. I cried for him knowing he would never know just how wonderful his life would have been with Steve and his team at Rolling Dog Farm. I know he runs free and painless now over the bridge and is loved still. Thank you Steve for what you did for him and all those involved in trying to save this sweet pup. On a happier note — and after that week, we needed one! 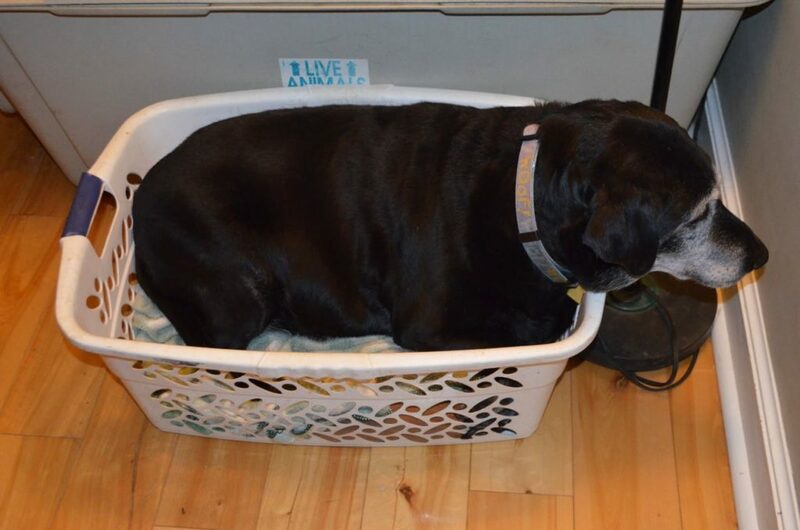 — I have another installment of our continuing series featuring?large dogs trying to squeeze themselves into small spaces. 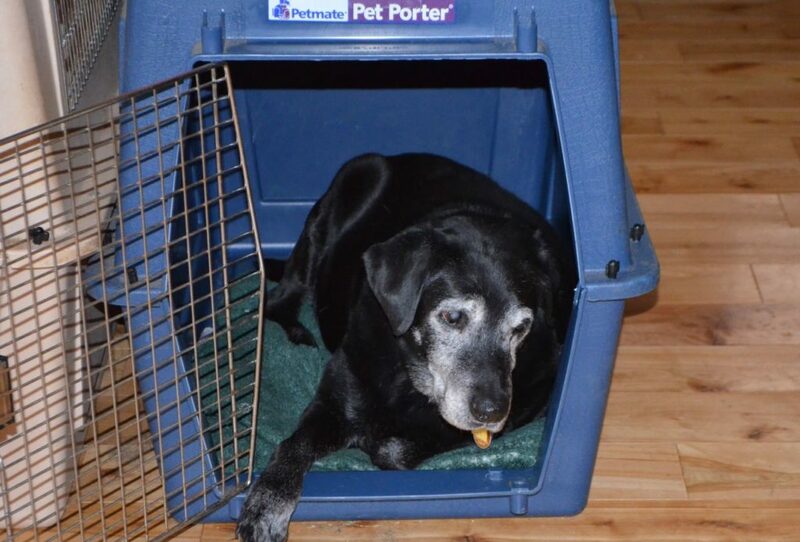 Even though blind Stella is free to hang out in the living room, she usually prefers to stay in the dog wing at the other end of the house. 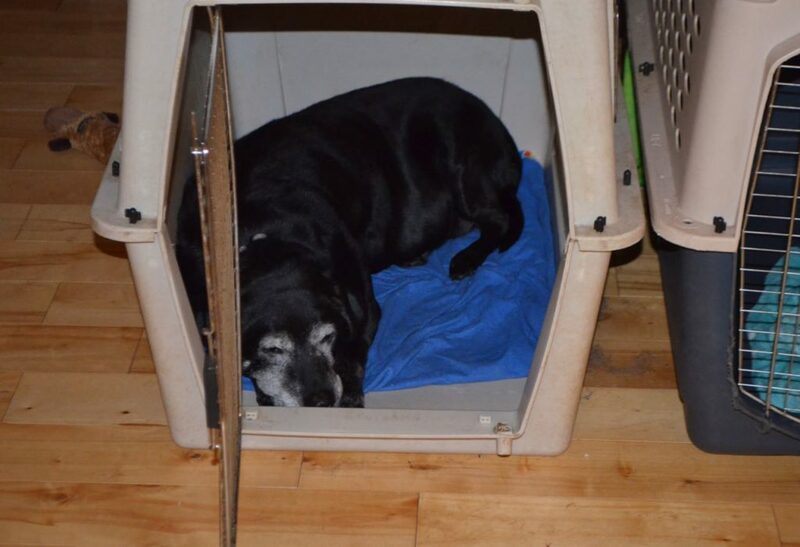 While there are several large beds on the floor, for some reason she likes to nap in’the smaller crates in the room. Every day we will find her sleeping in another one, always sized for a dog much smaller than she is. 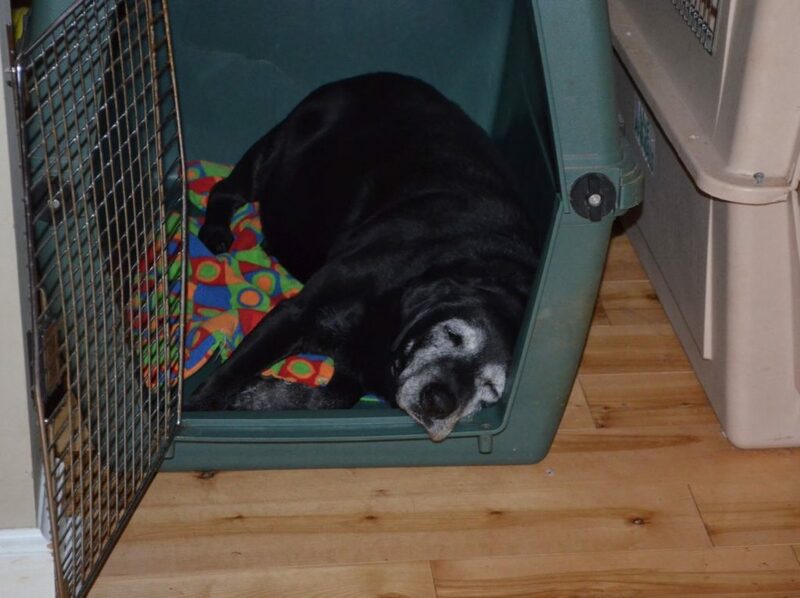 Stella is a very big girl — 80 lbs or so — and she has a giant crate of her own to sleep in at night. 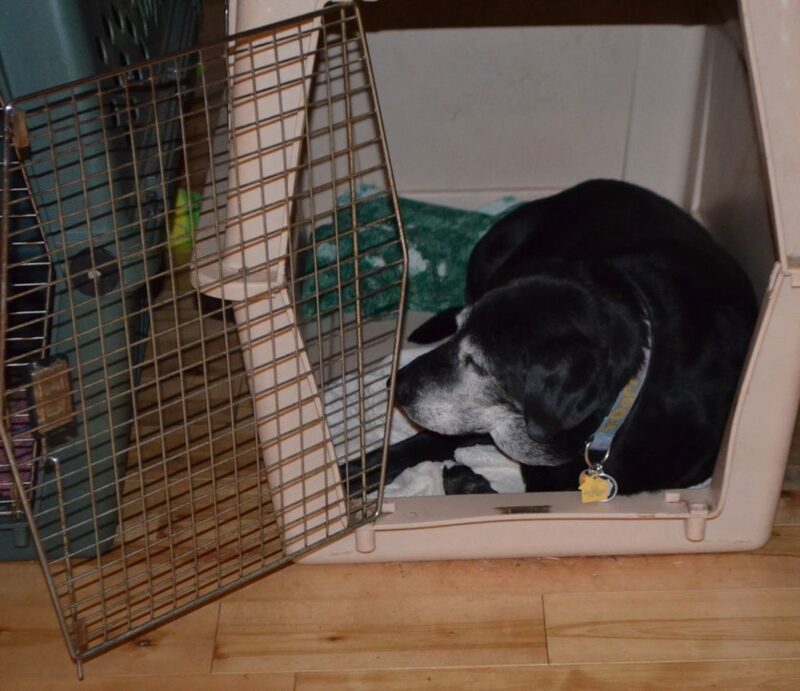 That crate is also right there in the dog room, with the door to it wide open. Meaning she could take her daytime naps in it if she wanted. But, she’d rather?work herself?into the smaller crates. Oh my goodness, how funny is she?? She’s in everyone’s crate but her own. It’s like Goldilocks where she’s trying out all the beds. I’m sure she knows the way to her own, but chooses to try out all the rest. It must be the coziness of the smaller crates. I wonder what her brothers and sisters think when they get ready for bed knowing that someone else has been sleeping there. And then her in the laundry basket?? How very silly and cute. She’s so sweet. That’s a beautiful letter from the animal hospital. It must be so hard on them to those sweet babies and carry on. Stella is just trying to find that perfect spot, I guess! Keep trying!! It’s definitely a trend! I wonder if the small spaces make her feel secure. Or maybe she enjoys the challenge of fitting herself in. Or maybe there’s just something special about a space that’s exactly your size. One of our dogs prefers to lie on the arms of sofas, chairs, etc. He is a dachshund mix, and he seems to enjoy spaces that match his long length and skinny width. Stella wants to feel cuddled. The cramped space gives her that feeling. Maybe it is her way of swaddling herself. How sweet! I’m guessing it’s a sense of security for Stella when she is in the smaller places. What a cutie pie! Sheryl’s comment certainly confirmed the love Fletcher must have felt in his last hours. Miss Stella seems tobe trying to figure out which bed “is just right” Adorable! Clearly there is a Laundry Basket Challenge going on at RDF. God bless you and ALL the beautiful animals! They are such a blessing to us people, I’m happy that some of these precious loves get a second chance, I wish all the animals, disabled , blind, deaf, and healthy could all be loved and treated with love. Thank you for all you do, Stella is adorable as are the others!! It sounds like Goldilocks and the Three Bears. “This chair is too big.” “This chair is too little.” “This chair is just right.” Each day it changes. Looks like Stella could be a bit chunky(? ), so she’s just trying to show everyone she can still fit her svelt(?) body in the smaller crates. Or she might be trying to tell her servants she wants a pair of spanks for doggies. What ever works Stella!